Enjoy your breakfast in bed, watch a movie with your children and savor your favorite nachos, soda drinks, or work on your projects without getting out of your bed, these are many things you can do with your foldable bed table. It is ideal for camping, hiking, or fishing, since it is very slim, foldable, and light - talk about many birds with one stone! Widely use: It acts as a multifunctional laptop workstation, a standing desk for office work, a TV tray for snacking,a standing table for office work, laptop couch table, outdoor dining table. Perfect for picnics, beaches, parties, fishing, camping, outdoor concerts, & more - talk about many birds with one stone! Sturdy and durable:Made of high-quality material, which is water-proof & stain-resistant,environmentally friendly but very sturdy, strong and durable. Lightweight aluminum alloy leg enough to handle weights up to 30 kg. 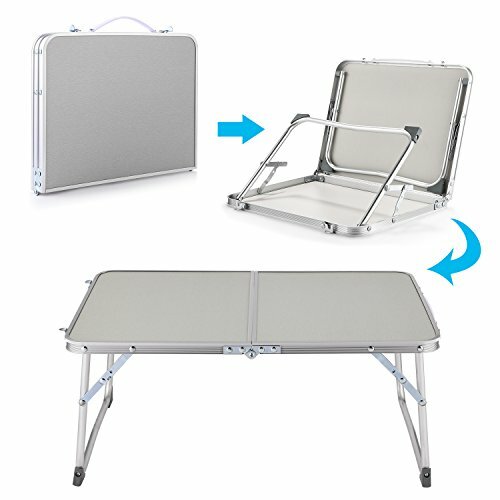 Inner Storage Space and Soft Handle:When the table is folded, have an inner storage space for books, notes, mousepad.To make this aluminum camping table easy for transportation we choose to use light weighted material and a sturdy handle special designed to keep it comfortable in your hands. Easy to carry:It can fold flat for convenient storage, is light enough to carry around and carry it to everywhere. Large surface - The size of the tabletop is 40 x 60 x 27 cm, it fits a 16 inch laptop,keyboard and mouse, elbows to rest as well as the 23.6 inch distance between its legs offers ample space for stretching your feet under it.